16/2/12 - Acquisitions - Montpellier, Musée Fabre - Among those artists highlighted at the Musée Fabre there is obviously the one who bequeathed his collections and gave it his name, François-Xavier Fabre. Besides the great retrospective staged in 2008, the museum continues to make regular purchases of his works. Thus, no less than three paintings and four drawings have joined the collections since the exhibition. The first painting (ill. 1), purchased at Sotheby’s New York on 26 January 2012, for $146,000 (including charges), is an unpublished landscape, signed and dated 1815, the only known work for the artist that year. 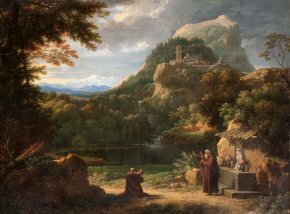 Representing Saint Anthony of Padua Instructing Two Novices, this canvas is a beautiful example of Fabre’s landscape art, inspired by Poussin and Gaspard Dughet, but in a more precise and porcelain-like manner. Of particular note are the delicacy and minute details (such as the tree leaves), as well as the subtle colors of the mountain chain glimpsed in the background. The two other paintings, two companion portraits, show Mr. and Mrs. Louis-François Bertin (ill. 2 and 3) and were purchased in a private transaction from Sotheby’s in June 2012 . This is indeed Bertin senior, the same person represented by Ingres in the famous painting residing at the Louvre. We of course find it hard to reconcile the self-assured, portly bourgeois depicted by the master with the juvenile allure found here. This likeness was painted in 1803, as a companion piece to his wife’s portrait, produced in 1802. Bertin was exiled by Bonaparte in 1800 and resided in Florence at the time, returning to France only in 1805. Though included in the 2008 retrospective catalogue, these two paintings had finally not been lent to the museum by their owners, descendants of Bertin. The four Fabre drawings were also acquired at auction. Two unpublished sheets were purchased at Christie’s New York on 29 January 2009 for $3,500 (including charges). The first represents The Death of Saul (ill. 4), the subject having been identified by the inscription which repeats the final words of Vittorio Alfieri’s tragedy Saül, published in 1784 : "Impious Philistine, you will find me, but at least, here, having died as king . A painting representing The Vision of Saul, commissioned in 1801 by the Countess of Albany, Alfieri’s mistress, from Fabre along with another painting, unfinished and with an unknown subject, was delivered in 1803 shortly after the poet died and today resides at the Musée Fabre. It is possible that this drawing represents a very early draft for this second painting, however with a very different format and composition from that of The Vision of Saul which should have formed its companion piece. The second drawing acquired at Christie’s illustrates the subject of Arria and Paetus (ill. 5). While there is no known work with this subject by Fabre, we should recall that in 1784 François-André Vincent represented it in a canvas recently acquired by the Saint Louis Museum of Art. Although in these two studies "we recognize the quick and incisive treatment which Fabre adopted in his sketches after 1797-1798 ", the other two sheets (signed) acquired in Marseilles, at a SVV Leclere auction on 31 October 2009 are much more accomplished. One shows Belisarius and his Guide (ill. 6), a subject which Fabre treated only in a copy, exhibited at the Salon of 1784, of the famous David painting held in Lille. However, the composition here is quite different. The other drawing is a finely achieved Neo-Classical landscape (ill. 7) which once again demonstrates the artist’s reflections on the art of Nicolas Poussin. The ensemble of drawings sold by SVV Leclere came from the collection assembled by the daughter of the Italian Neo-Classical painter Pietro Benvenuti. 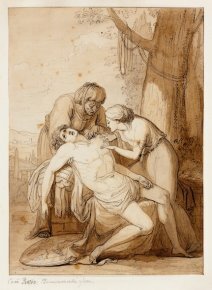 During this same auction (in which the Département des Arts Graphiques of the Louvre had also pre-empted several works), the Musée Fabre purchased a sheet by Pietro Benvenuti as well, presented as Tancred Helped by Erminia but now held at this institution as Saint Sebastian Tended by the Holy Women (ill. 8). If this is indeed the second subject, as indicated by the rope hanging from the tree which no doubt served to tie Sebastian, it is nevertheless surprising that there are no arrows[In fact, as pointed out to us by Humphrey Wine of the National Gallery in London, there is indeed a very discreetly drawn arrow, which Irene is withdrawing from Saint Sebastian´s shoulder.]. These three drawings were acquired thanks to the Musée Fabre’s Fondation d’entreprise. We mistakenly stated that they had been pre-empted. The inscription on the drawing is in the original language, Italian : "Empia Filiste/Me troverai, ma almen da rè, qui, Morto". Taken from the written entry for the Musée Fabre’s acquisition.